Ethiopia has always been a country that has interested me. One of the few African countries that never really endured colonial rule, Ethiopia has stood the test of time with thousands of years of rich history. Of that history, one topic of great interest to me is that Ethiopia is the championed birth place of coffee. But alas, my low funds have kept me from a trip to Africa and so when I decided to make a stop in DC to visit a friend, I was intrigued when he suggested we visit an Ethiopian coffeehouse called Sidamo. 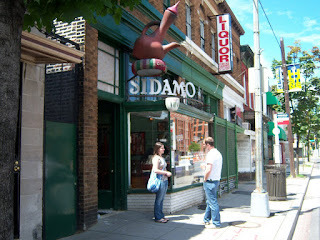 Located east of Union Station on H Street, Sidamo stands out with a huge ceramic pot jutting out over their open storefront windows. Inside, the cafe has a long layout with nice exposed brick, beautiful pieces of art and a gorgeous garden patio in the back. 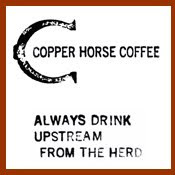 The coffee is roasted in-house and all sourced from Ethiopia (at least that's what I interpreted). 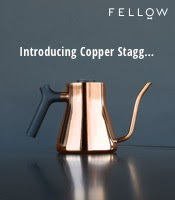 I had a decent cup of their Ethiopian Sidamo that demonstrated a bright cinnamon, cherry-esque coffee that was just a tad too dark and had minor hints of cardboard. The espresso faired decently as well, with a short pull producing hints of white chocolate, a buttery texture, fair crema and a bit of a bitter bite on the end. The tea is free leaf. While I wasn't blown away, I really savored my experience at Sidamo. It's rare to find a coffeehouse based on one country's coffee and plus, the people there were super nice. Hopefully, the place keeps getting better as it seems to have a lot of potential. If you happen to be around, give Sidamo a swirl. Ah, Ethiopia is the birthplace of humanity also. Maybe that doesn't seem as important to you, though. Very interesting thanks for sharing! What do you mean by a short pull? Aren't the espresso machines automatic. Push a button and it shoots out the same amount of water each time. How I wish now that I would have purchased at least one cup of coffee when I was in D.C. last year. I was at Union Station, and was so preoccupied with train schedules, that I didn't not stop and explore all the very interesting shops there. Oh well, next time.